Wow! Our Captain Armando holds the pointy-end of a big fat wahoo that Gary Tsunoda of Las Vegas popped just outside of Bahia de Los Muertos. Our amigo, Gary, had a great week of fishing with a number of species and some awesome trophys ,but this one was a gem! 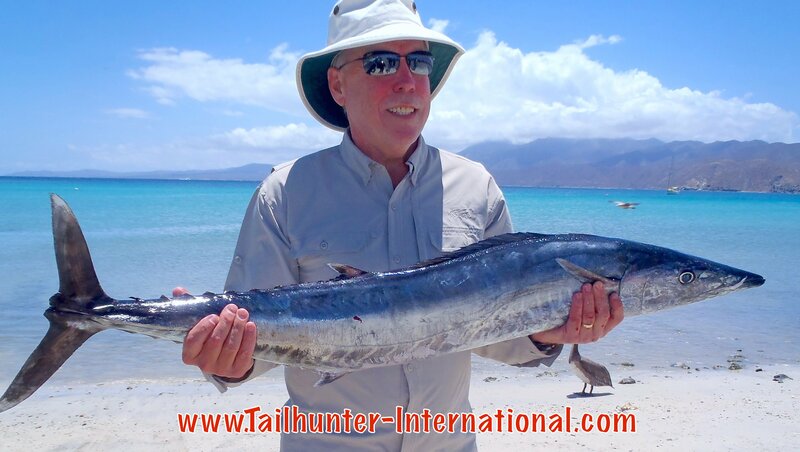 Good week for wahoo…and some were very very close to shore! Our best week of the year for roosterfish! 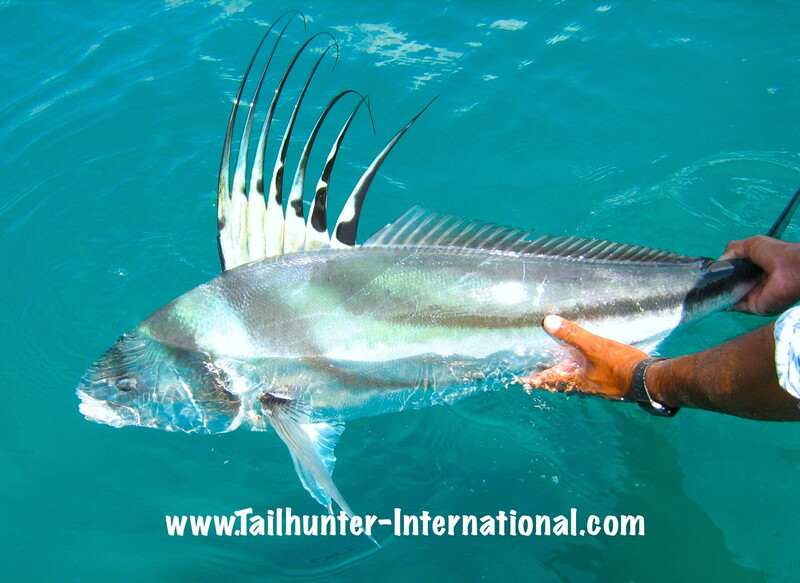 Some days our anglers got 3-6 roosterfish each panga an many were very close to shore and not too far from the beach. Bait worked best, but even our flyfishers got them as well with almost all the fish, like this one from Jorge Romero headed back to live, grow and fight another day! You’re probably not gonna see too many pretty wahoo with such perfect coloring as this one caught by our amigo, Tom Brown, who owns Big Left Turn Yacht Management here in La Paz. Boy, did he have a good day that started right off the bat with this awesome yahoo that literally looks like it came from being airbrushed! 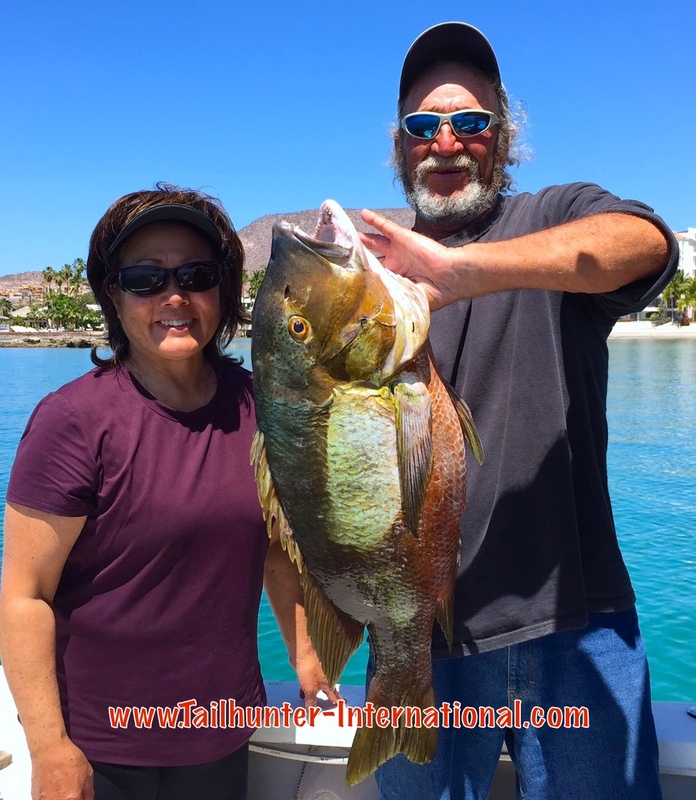 They also caught giant pompano, dorado and a huge sierra. Captain Pancho gets in on the photo. Great shot! 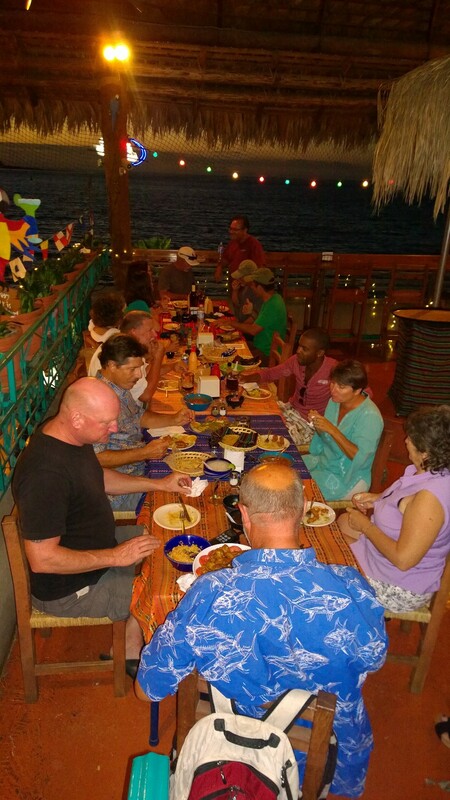 Lots of the fish that Tom and his buddy, Tim, caught went towards a big fish party they held for 13 amigos that same night at our Tailhunter Restaurant that included, ceviche, Hawaiian marinated poke, battered fish tacos and mahi mahi en chile poblano sauce! Nothing better than fish that was swimming in the morning and dinner at night! 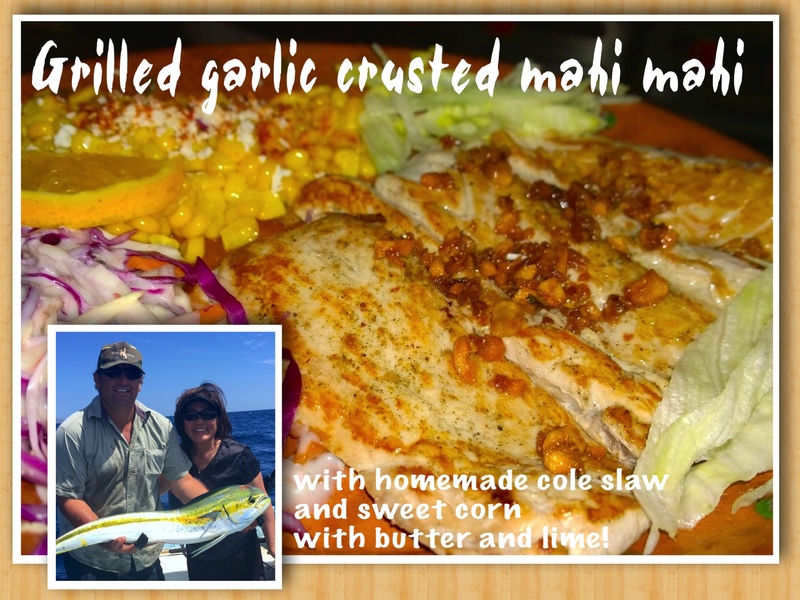 Tom’s dorado was prepared with our award-winning chile poblano sauce! Whoaaa…lift that thing for the photo, Roger! Roger Thompson rocked it big time with this nice striper…a huge one this week. They tried to revive it insuccessfully, so they donated the meat to various families. Roger never gets skunked. Love this photo! Flyfishers ALWAYS seem to know how to pose and take good photos. Tyler Lyon from Utah spent a few days with us and his flyrod doing great with his hand-tied flies. “I couldn’t keep the fish off of the fly! he told me! He got into several nice roosterfish like this one. He told me at one point, “I saw a school of 70-pounders go cruising by!” He released all fish. 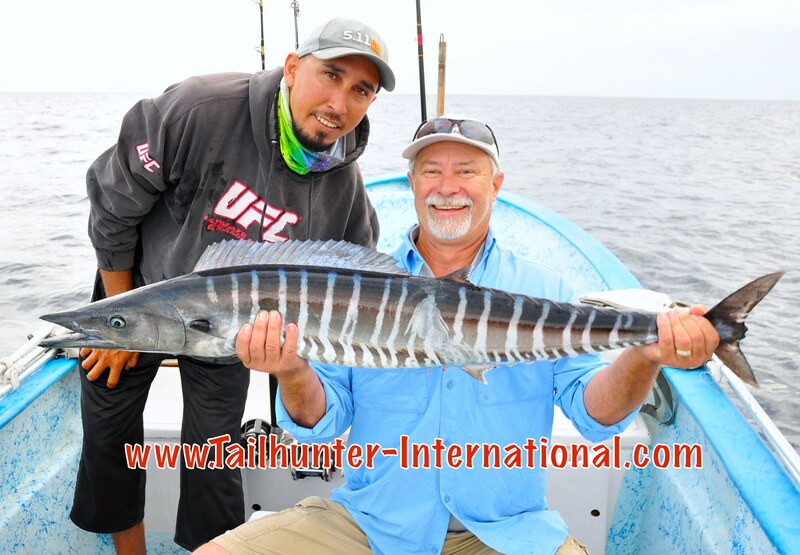 Dave Henderson from the Los Gatos CA area was with us for his first La Paz fishing trip and put the wood to a nice wahoo on his 2nd day! Yes! And dorado too! Captain Armando takes the photo op on the beach at Bahia de los Muertos with Gary and Lois Tsunoda, our Las Vegas amigos! It ended up as sashime at our Tailhunter Restaurant. Wow! 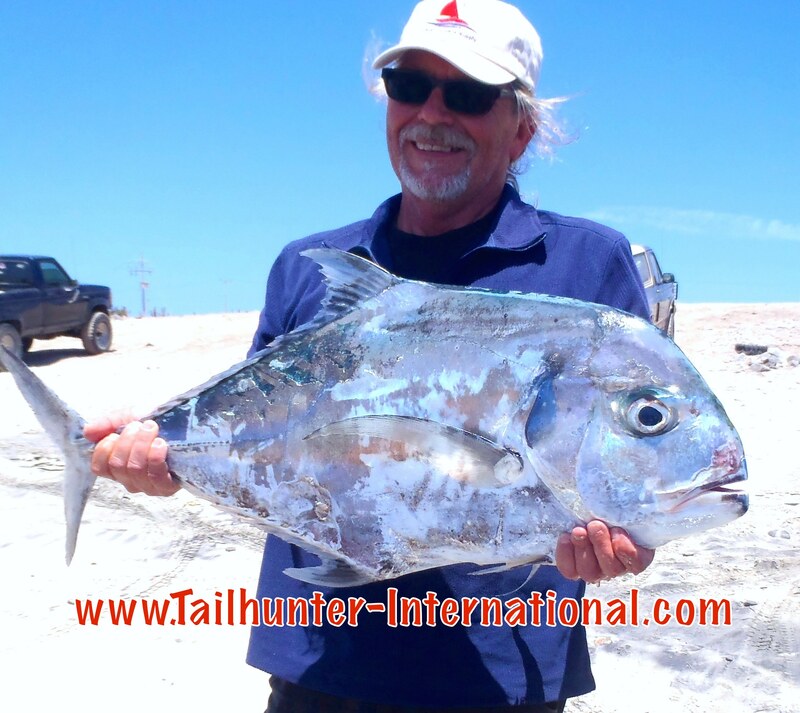 Now THAT’S a big pompano! It was a great week for pompano…cousins to the jack crevalle, roosterfish and yellowtail. They taste great and good runs of them come through about this time of year. But this one is like a pizza pie plate! Tim rock this bad boy just outside of Bahia de Los Muertos. Lois Tsunoda always wanted a big pargo and this was her first. It wasn’t her last. She got several during the week. 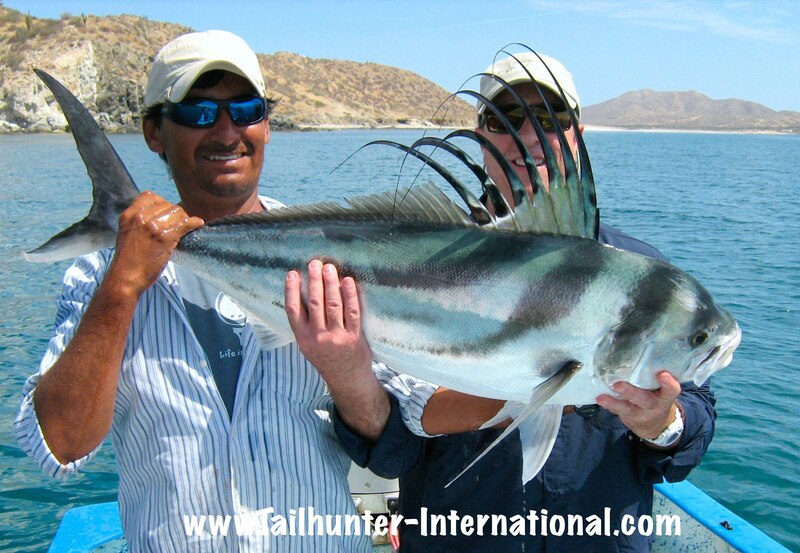 Captain Alfredo with our Tailhunter La Paz fleet lends a hand. Big old fat fish. The head is great for soup! 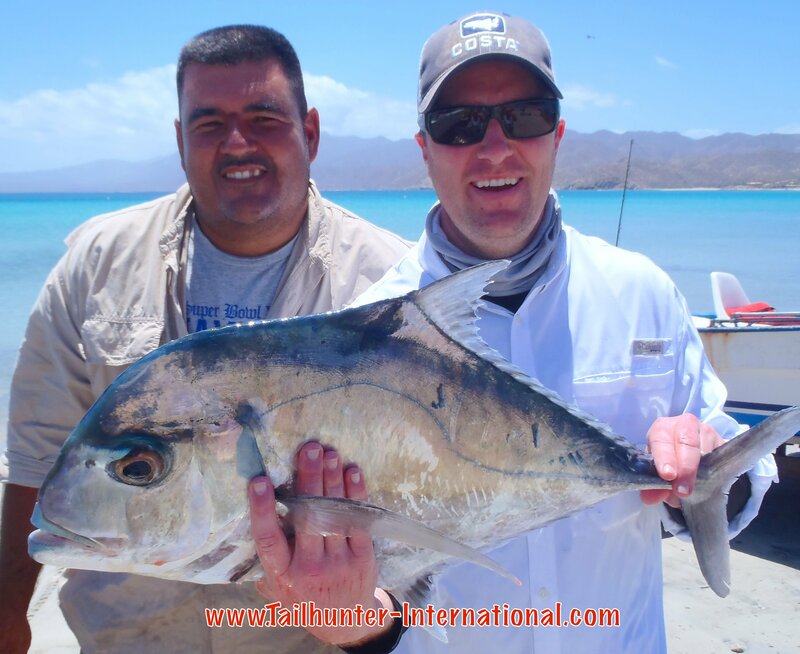 Many of our anglers bring their fish in to have us cook it at our Tailhunter Restaurant on the La Paz malecon waterfront. 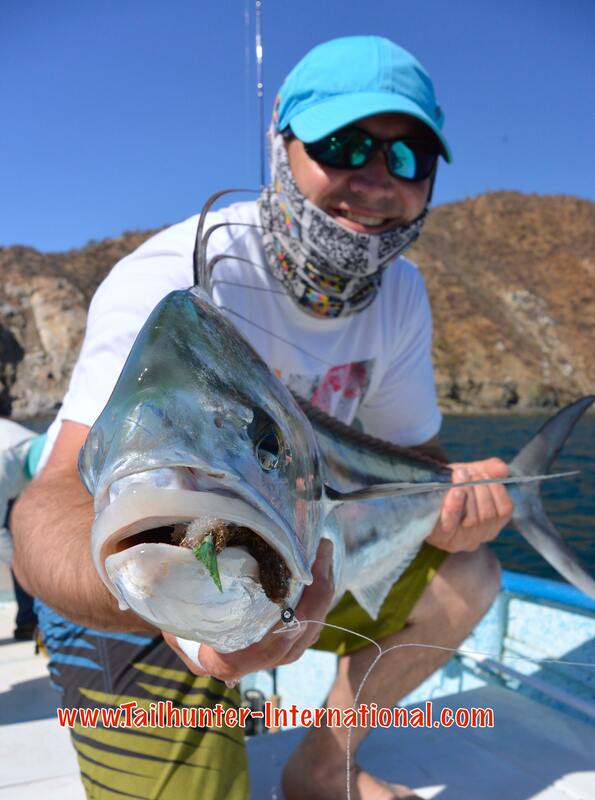 Tyler Lyon give his wife, Sarah, a hand for the photo of one of her jack crevalle they caught fishing north of La Paz. They were on their first trip to La Paz with us. Somewhere behind that comb, Robert Pettit from Utah holds up one of his roosterfish he caught and released. Check out how close to shore he is! Captain Adolfo lends a hand and a smile. That’s Bahia de los Muertos in the background. Roosters ripped it up this week. Local ace, Roger Thompson, with another beast. 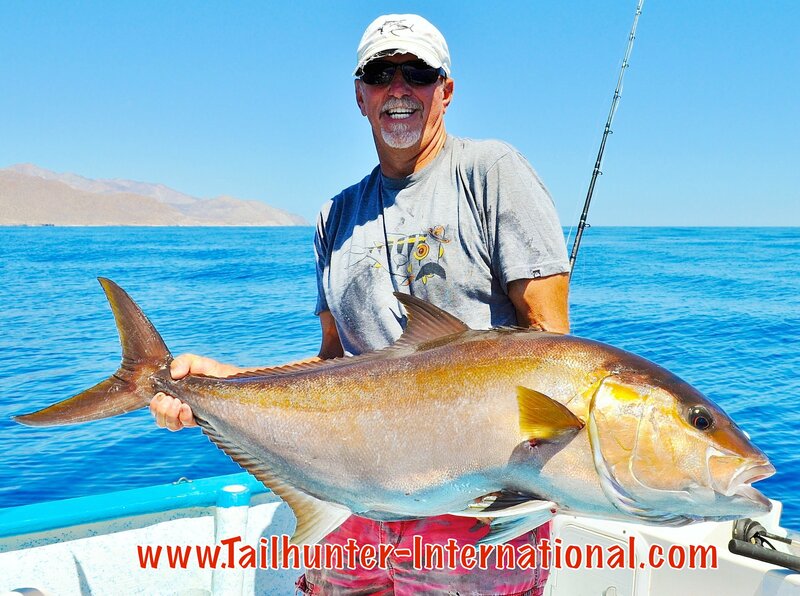 Check out the colors on this huge amberjack! 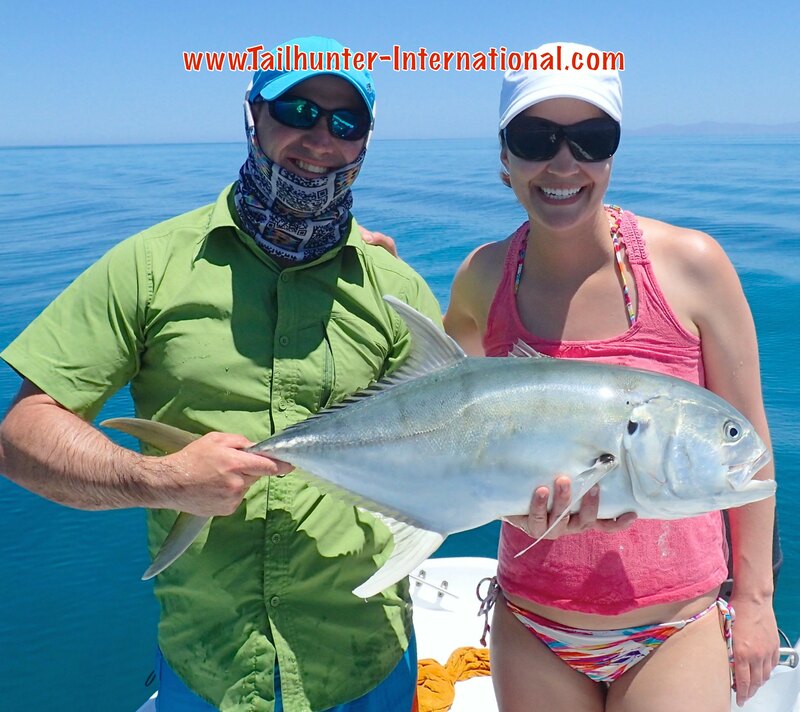 Garrett Sills was another of our anglers on his first trip with Tailhunters. He’s got his hands one of those nice pompano that was chewing all week. Captain Gerardo in the photo as well. Alaska in the house. Gordy Robertson, who guides up in Sitka, Alaska holds up another nice rooster like about the size we were getting all week. They get bigger! 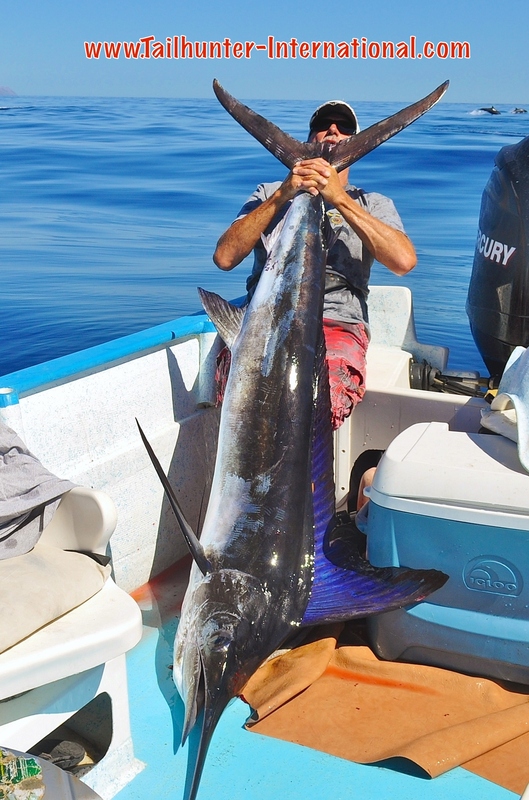 ROOSTERFISH AND WAHOO HIGHLIGHT STRANGE WEEK! It wasn’t a great week of fishing, but for certain species it was VERY good fishing. Pesky early spring winds and even a thundershower hampered anglers; made the seas a bit bouncy some days; and thwarted efforts at getting bait some days. So that was no help. But, overall, it wasn’t bad. 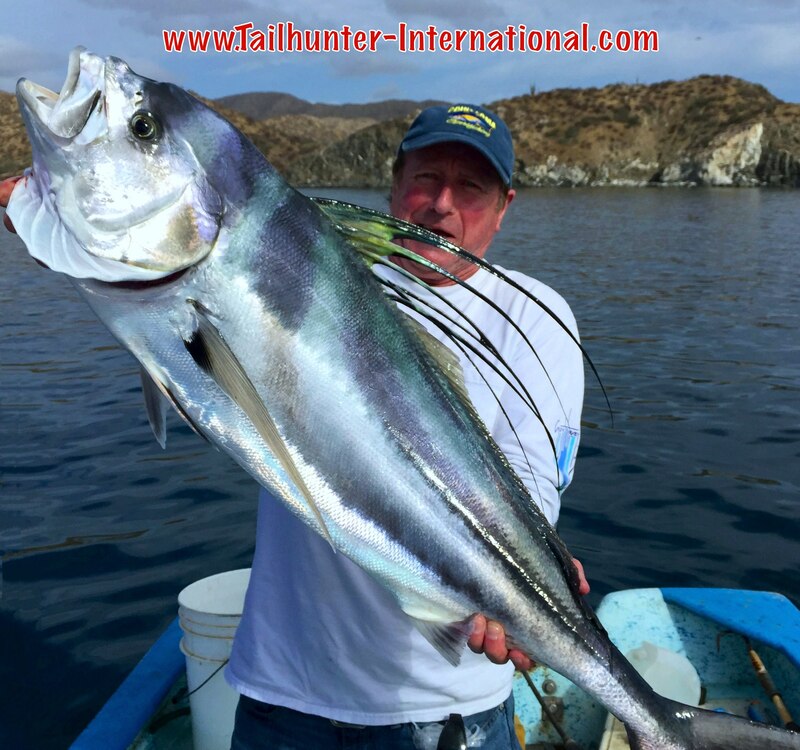 Thankfully, rooster fish and pargo carried the day for many of our anglers who caught their first or largest of the species. Here’s where the winds played the most havoc. Especially in the nights and early mornings. With the mornings a bit blustery about 1/2 the week, it made getting the big mackerel difficult to jig for or purchase. And mackerel are what the big yellowtail like to chew. Consequently, our yellowtail counts were quite a bit down this week. However, when the mackies were in the bait tank, the fish bit pretty well around Espirito Santo Island. The problem is that so many fish were lost! 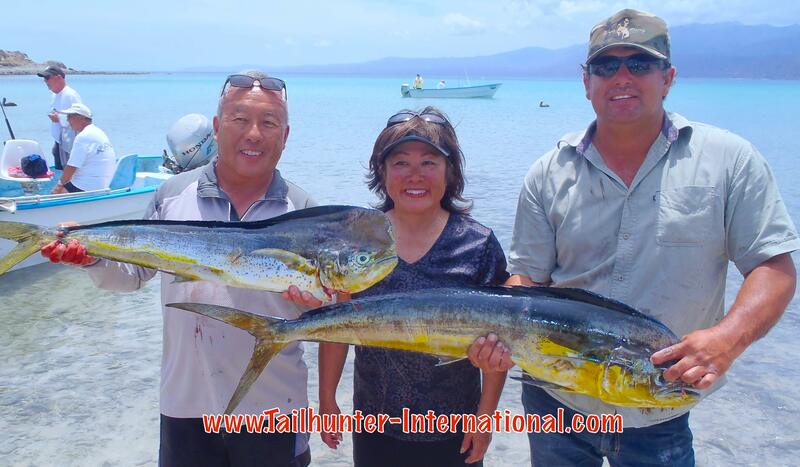 I would say that about 3 out of every four yellowtail took the anglers right back to the rocks! So, fishing was good. It was the “catching” that was problematic. Some of the fish ran 15-40 pounds that I did see so there was a nice range of fork tails. One nice bonus were the nice barred pargo (pargo mulato) that were brought in. I mean, these were PIG fish! Just big old fat nasty bad attitude pargo that busted alot of lines and bent the rods. The ones that did get in were 10-20 pounders. One of our clients had us bag up the head for soup and the head alone weighed 5 pounds! I’m a little worried that with the weather and water getting warmer that we’re already moving away from our cooler water species like the yellowtail and the season maybe be diminishing. I’ve been wrong before. We’ll have to wait and see what the coming weeks bring. I’m sure we’ll get a few more windy times coming up! Again, like previous weeks, this is where the variety lies. 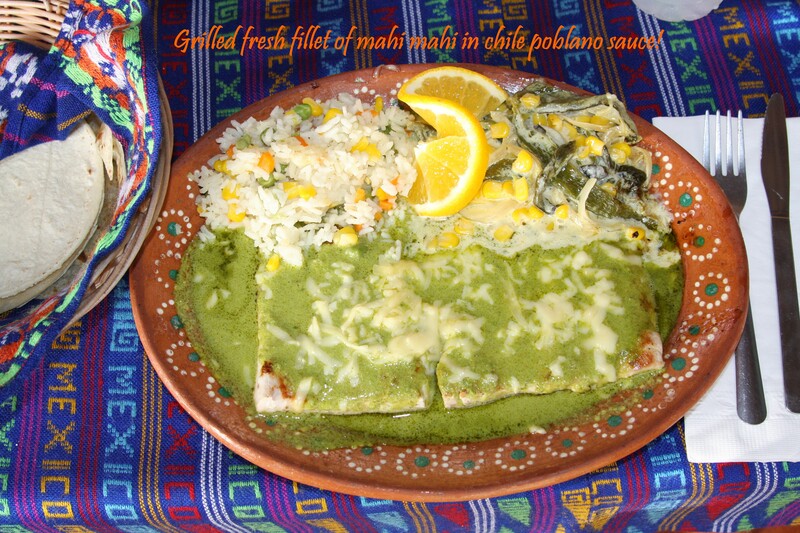 If you want big fish, but fewer fish, we have our folks fish La Paz. If you just wanted fun grab-bag action and never knowing what you would hook then Las Arenas/ Muertos is where we’d put you. Not kidding…if you add in all the bonito you wanted plus pargo, cabrilla, jack crevalle, sierra, plus fish that busted off…it could easily be a 20-30 fish day! But the really fun thing were the “bonus fish.” The weekly stars were the pompano and rooster fish that really took off. Especially, the exotic rooster fish. Nothing really really big, but some days each of our pangas would land 3-5 roosters very close to shore that went 10-30 pounds. Larger 30-50 pounders were seen as well! Our flyfishers really enjoyed themselves on the pez gallo! In those same areas, their cousins the pompano made their first good appearance of the season and did great for flyfishers and light tackle guys on these great eating fish. 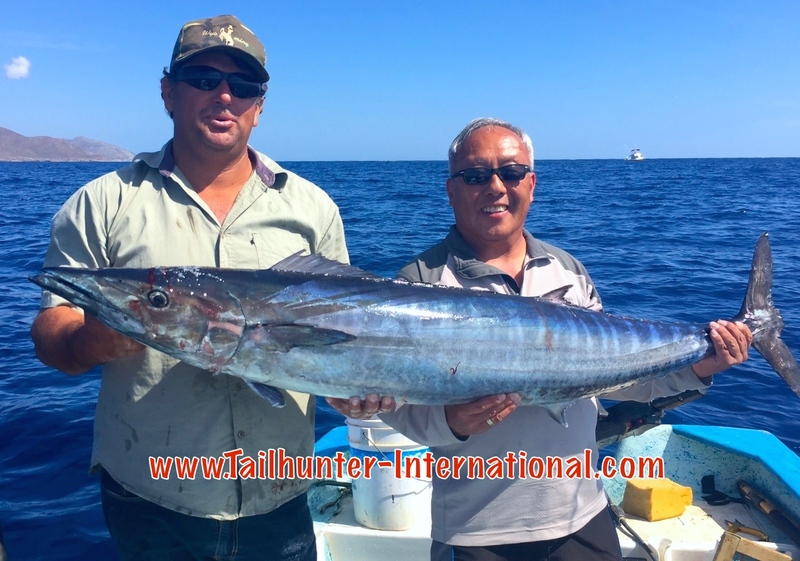 Tuna were seen, but none hooked but we did get into some nice wahoo at the south side of Cerralvo Island that ate the dark Rapalas and several marlin were hooked and released. Plus we had some amberjack biters as well. Great variety! Every day, we’ve got 5-10 whalesharks in the bay and folks are having a blast swimming with them! I will be visiting my Mom in late June @ Los Barriles, and I will be fishing from her kayak, any advice on what lures I should bring? I plan on trolling live bait so if you could tell me what type and size hooks I should buy would be great.